This Week you are getting Yukon Gold potatoes, carrots, red onions, fennel, squash, cucumbers, broccoli purple bell peppers and muskmelon. The fronds and bulb are both eatable on this delicate, wonderful, spicy, sweet bulb. Many people love to shred the bulb and add it to slaw and salads. It is enticing cooked under roasts (it caramelizes) and roasted with root vegetables. The fronds can be added to potato & macaroni salads as well as fish. Oh Yum!! Purple bell peppers are best eaten raw. They can definitely be cooked; they just turn a strange gray color! So if you are putting them in a wrap, go for it! But if they are going to be seen (perhaps in a stir fry); I wouldn’t cook them! I have just been informed that Tuesday members are the only ones getting this…most of the field is not ready to be picked. Honey: I am very sorry, but you should have gotten honey last week. I simply lost track of time! Only those of you who get monthly deliveries will get honey this week. I am talking with Lazy Bee to find out if there will be a harvest of honey next month or if they anticipate the harvest will occur in September. Depending on the outcome, those of you who get a one time delivery will get their honey after the harvest. Fruit: You will be getting a fantastic Bing cherry this week from First Fruit called Lambert’s. This is an older variety and a late season variety. It should be tastier and sweeter than the others you have been getting. Produce Payments: Half of all your remaining fees were due the 15th of July (except for animals). Late fees of $25 will be applied on July 24th. Please allow 2 weeks for us to process your checks (will still get credit for arriving on time). We will do our best to get them processed just as soon as possible. Produce will be cut off for anyone who has not paid in full or followed their payment schedule the week of the 23rd. So get those payments in!! Even though we have a few tired and true ways that we like our fennel, I am always looking for something else to do with it each year when it makes its appearance in our share. As I was looking through several cookbooks, I kept finding a similar recipe for fennel with a lemony dressing. I chose one that used only ingredients I had on hand, always a bonus in my book. My husband and I really liked it, most of the kids thought it was fine, but my 4 year old had three helpings! Here’s the recipe for Fennel Salad from the Nourishing Traditions cookbook. Fennel Fronds and Freckles on my Lettuce? Yes! In our shares this week, we are getting a lovely red speckled lettuce! It’s not rust, so don’t throw it out! I don’t remember the name of this lettuce, exactly, and I forgot to grab my newsletter, so you’ll just have to trust me on this – it’s supposed to look that way! Speaking of newsletters, Jacquie and I got together this week, and she’s going to start sending me copies of the newsletters to put up on the blog each week. So what else is in the share this week? Well, lots of good yummy things, but one that I really look forward to is the FENNEL! 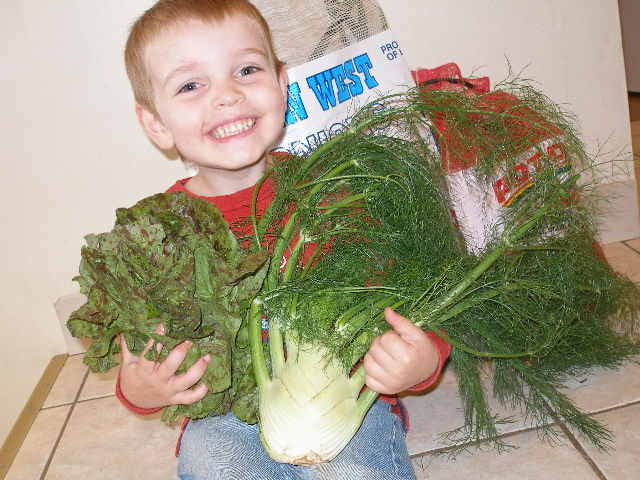 Fennel is completely edible, fronds, stalks and bulbs. The white bulb part of the fennel has the most delicate, light anise flavor, and can be braised, grilled, baked, steamed, or eaten raw. The green stalks of the fennel are sort of celery-like, very fibrous. They can be used in soups and stews instead of celery, added to tomato sauce, or chopped up for a nice crunch in your salad. The lacy fronds are a tasty addition to salads and can be used as a fresh herb similarly to dill. The fronds have the strongest anise flavor of the whole fennel plant. Some people are a bit intimidated by fennel because it smells like licorice… I know I was at first. But after trying it a few times, I realized it’s very versatile, and does not taste as much like licorice as it smells. It’s very mild. Before cooking your fennel, trim the root end of the bulb. The stalks should be trimmed about an inch above the bulb. And, wrapped in plastic, your fennel should keep in the fridge for a couple of days. You will want to use the fennel sooner if you like the anise flavor, as the flavor tends to fade, the longer it is stored. One last random fennel fact: it was supposedly Thomas Jefferson’s favorite vegetable! Do you have a favorite fennel recipe or tip to share? ?